500 yen/TRANS ARTS TOKYO 2013 Passport (800 yen) can be used for this exhibition. 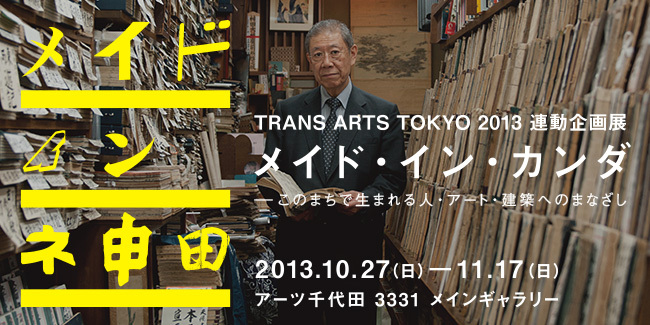 Artists: TRANS ARTS TOKYO 2013 Passport is available at the reception of 3331 Arts Chiyoda. It can be said that Kanda is a place where the energy of the city and lives of people full of human warmth come to mix together, a place located in the center of Tokyo which while welcoming the possibilities of all kinds of culture and people, and scenery, has the power to bring about a new energy. In this exhibition, artists, photographers, and architects who felt attracted to "Kanda" will perceive it from various angles. In photographer Masanori Ikeda's (YUKAI) "Kanda Portrait Project" where Kanda natives are his models, and in "Kanda Street Observation 2013" which will be orchestrated by artists and local residents, attention will be drawn to the people and city of Kanda from an everyday perspective. Architect Yoshiharu Tsukamoto (Atelier Bow-Wow) who presented "Made in Tokyo" in 1996, has formed a new team to construct "Urban Kandalogy". Emerging Korean artist, Seung Woo Back will stay in Kanda to produce and present new works from his "REESTABLISHING SHOT" series in which aerial views of the city will be combined in collages. With a loving look toward the town and through observation of the city, please enjoy the creativity born out of the streets of Kanda, together with the bountiful appeal of its history, cuisine, and people. Masanori Ikeda "Kanda Portrait Project"
From historic soba shops, celebrities of the Kanda Matsuri, owners of old book stores to young café entrepreneurs, Ikeda presents 40 portraits of locals from his ongoing series, each filled with the heart-warming essence of Kanda. Seung Woo Back "Reestablishing Shot"
The Seoul based internationally active artist Seung Woo Back takes up residence in Kanda and searches out a new blueprint to its urbanscape. Taking photos from high buildings commanding a panoramic view across the district, he constructs images which offer a multi layered perspective upon this particular mix of old and new. Photographer. Born 1973, Daejeon. Lives and works in Seoul. In 2002 graduated from a master course in photography from Chung-ang University. In 2005 completed PhD in Aesthetics and Art Theory at Middlesex University. Shows in Japan include the 2011 solo exhibition at Misa Shin Gallery. He exhibits widely throughout Korea, as well as in New York and Paris, amongst other international cities. Atelier Bow-Wow+Tokyo Institute of Technology, Department of Architecture and Building Engineering TSUKAMOTO Lab. featuring OSARAGI Lab "Urban Kandalogy"
This collaborative team is undertaking unique field work in Kanda, analyzing its current urban image, and offering commentary upon it, in the development of an original Kanda version of their famed 1996 "Made in Tokyo" project, introducing architecture produced from the demands and chaos of the city. Kanda Street Observation Team "Kanda Street Observation 2013"
A team of artists and local people come together to capture the everyday landscapes of Kanda. Portraying the events and day to day scenes of the town with a particular sense of presence, they allow us to take a look at familiar settings from a new angle, in what may be seen as a form of homage to Genpei Akasegawa's "Tomason".